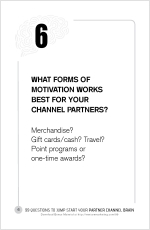 What's the best way to motivate Channel Partners? Home → Uncategorized → What’s the best way to motivate Channel Partners? What forms of Motivation works best for your Channel Partners? John Doerr (the same John Doerr of Kliener-Perkins) was responsible for my first encounter with Channel Sales incentive programs. At that time, he was a field sales engineer for Intel in our Oakbrook, Illinois sales office with an account base of SMBs, which purchased Intel products through one of three local distributors. Only a handful of our distributor sales reps had technical backgrounds. So, in order to be successful with their accounts, it was important for them to work in tandem with manufacturer’s sales people, like John (Rice Univ., BSEE/MSEE ‘74/’75). And while a distributor rep might be challenged to call on an engineering manager, they excelled at maintaining beneficial relationships with the purchasing department. For John to be successful, he had to work with the customer’s engineering team (often years in advance) in order to get Intel designed-in. Finding these engineers was a real challenge. In 1979 there was no internet, no email, no faxes and no LinkedIn! What would you do? Here’s what John did. John created a simple incentive program for his distributor reps. Here’s how it worked. He printed up 3×5 cards with blank organizational charts and paid $25 for each card that had been filled out with the names of the customer’s engineers. If you assume the average company had ten engineers, he was paying ~ $2.50/name. Talk about low-cost lead gen! Since that time I’ve learned a lot about incentive programs and effective ways to motivate people who are not your employees. It’s one thing to tell your sales force to do something. They work for you. Channel Partners… much more challenging. That’s why I decided to bring in an expert to answer: What forms of Motivation works best for your Channel Partners? I put the question to Mark Repkin, incentive and recognition expert and vice president at Certif-A-Gift. He’s also the author of Sales Contest-ology, a really helpful ebook available for download at Sales-Contest.com. Mark works with companies to create motivation and incentive programs for their direct and channel partner sales reps. When done right, sales incentive programs not only lead to higher revenues, they also give you insight and metrics you most likely don’t have today. My interview with him is available here.